The newer version includes higher quality illustrations. The newer version includes a quick reference sheet for the 2013 amendments to Class A (i.e. larger single storey rear extensions). 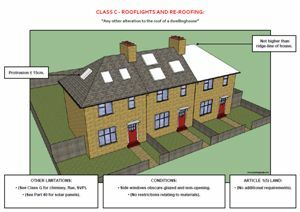 The newer version includes a quick reference sheet titled "What to check BEFORE giving advice on householder permitted development legislation". This entry was posted in Part 1 of the GPDO - Visual Guide on 13 August 2013 by Steve Speed.